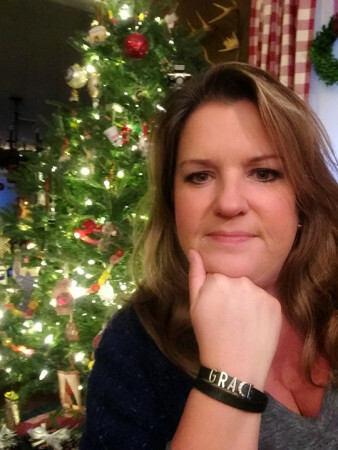 Today, on the last day of 2015, I want to sum up my journey this year with my One Little Word, grace. When I chose this word I had an image of myself, welcoming friends into our home, sharing our life and space with them, and treating them with love, kindness and respect. It took me a while to figure out the word that described that image but I finally caught it: grace. It perfectly described how I wanted to treat people, how I wanted to handle situations (the happy and stressful ones), and how I wanted to move through my days. Like everything in life, there were times when I felt like I nailed it and times when I felt like I completely missed the mark. But you know what? Nailing it every time isn’t the point. The point is to keep trying. To learn from our mistakes and do better when we know better. Come back tomorrow and I’ll tell you my word for 2016. A perfect reflection on a word that gives so much to both the giver and the receiver. Happy New Year Carole! What a lovely way to end the year. I start each (work) day by visiting your blog, and it’s a great way to gain perspective. Thanks for being a positive influence in the midst of so much that is not. Here’s to a great 2016. Happy New Year, Carole! While I haven’t met you “in real life”, I have that same image of you. You welcome us here, share your life and space with us, and treat us with love, kindness and respect. I think you’ve been practicing and living with grace for many years. Way to go and I’m looking forward to your word for 2016! Happy New Year Carole! I’ve picked joy for my word of 2016. You’ve inspired me the last two years to pick a word and be mindful of incorporating it into my life. Your word, grace, was not my word this year, but this last post, and the very last quote you wrote, is especially poignant for me today. My stepsister, who was the same age as me, dropped dead in February from a massive heart attack. Very shocking and hard to deal with. Her name was Grace. Then, at the other end of the spectrum, I have a beautiful, vibrant granddaughter age 11 named Grace. I think my word for 2016 will be grace in all it’s interpretations. Happy New Year and thanks for being here. Choosing a word based on a positive and real vision seems like the perfect way to chose your word. And, you do embody grace even to those of us you’ve never met! It sounds like you had a really good experience with your 2015 word. I did with mine too, but I’m unlikely to do it again for 2016. Wishing you & Dale a happy new year! I love that Elise de Wolfe quote! Happy New Year! Grace was my word a few years ago and yes, it is still with me. This year my word has been Meaningful and now think I have my word for 2016, I will sleep on it and see how I feel in the morning. Thanks for sharing this with us!! Grace is a good word. I have mine chosen for 2016 and will be sharing it tomorrow too! Never seen that before. Totally stealing it too. Thank you.